If you've been saving for retirement in a traditional IRA, you can still convert some or all of those funds into a Roth IRA. Is converting to a Roth a good idea for you? It can depend on several factors. Unlike with traditional IRAs, there's no tax deduction for savings contributions made to a Roth IRA, but earnings are typically tax-free. When you invest in a Roth IRA, you basically agree to pay tax now in exchange for that tax-free treatment when the funds are withdrawn later. An investor who uses a Roth IRA must defer taking any distributions until at least age 59 1/2 to achieve this completely tax-free status. The funds must also remain invested for at least five years unless some special circumstance permits otherwise. 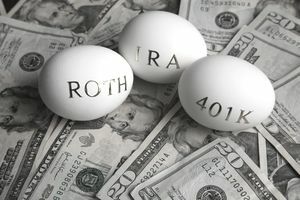 Absent any exceptional circumstances, withdrawing money from a Roth IRA early incurs not only taxes on the earnings but also a 10 percent penalty. Traditional IRAs can be either deductible or nondeductible. Deductible traditional IRAs provide for a tax deduction for savings contributions you make. Both your earnings on those contributions and your initial investment are taxed when the funds are eventually withdrawn. You can claim either a partial or no deduction for savings contributions made to a nondeductible traditional IRA. The earnings are tax-deferred until they're withdrawn, and the portion representing your nondeductible basis is returned to you tax-free. "Converting to a Roth" essentially means that you're changing the tax treatment of the fund in which your retirement savings have been placed. Instead of the tax deferral that's available with a traditional IRA, Roth IRAs represent post-tax contributions so converting to a Roth means undoing that deferral: You must pay tax on the accumulated earnings and on any savings contributions for which you took a tax deduction in previous years. This converts the funds into post-tax money. You can your convert your savings from either a deductible or nondeductible IRA to a Roth IRA by simply telling your bank or other financial institution that you want to do so. You can keep your funds at the same financial institution. You can even keep them in the same investments. All you're doing is changing the type of account that holds them. The trickier part is figuring out the tax cost of converting to a Roth. When you convert your traditional IRA to a Roth, two things happen. The government taxes the current value of the funds you convert, and those funds now become your basis in a Roth. First, figure out your Roth conversion income. If you're converting deductible IRA funds, you'd report as income the current value of the funds on the day you make the conversion. Your basis in a deductible IRA is zero because you received a tax deduction for your savings contributions. If you're converting nondeductible IRA funds, report as income the current value of the funds on the day you convert, less your basis. If you contributed $5,000 to a traditional IRA in 2016 and received no deduction for that contribution, your basis in those funds would be $5,000: $5,000 of income minus zero for the deduction. Now let's say you decide to convert that IRA to a Roth two years later in 2018. The value is now $5,500. You would report $500 of income on your tax return: $5,500 current value minus the $5,000. If you own both deductible and nondeductible IRAs, tax law mandates that your basis in the nondeductible funds must be spread out over all your traditional IRA funds, even if they're held in separate accounts at different financial institutions. You would logically want to convert nondeductible IRA funds first because there would seem to be less of a tax impact, but that's not how the tax math works out. Let's say you contributed $5,000 to a deductible IRA in 2016, which means your basis is now zero in those funds. In 2018, you contributed $5,000 to an entirely nondeductible IRA, which means your basis is now $5,000. You have $10,000 in traditional IRA contributions with a basis of $5,000. If you were to convert all your traditional IRAs to Roth IRAs and the value of your IRA account was $11,000, you would report as income $11,000 minus $5,000—your basis—which would be $6,000 in income. Someone with mixed traditional IRAs might think, "Let's convert only the nondeductible IRA," but her basis would still be prorated across all her accounts. Assuming the current value is $5,500 in each IRA fund and she converted only $5,500 from the nondeductible account, the math would still be the same: $5,500 (current value) minus $2,500 (basis prorated). This would result in income to report of $3,000. You can "isolate" your nondeductible IRA funds by rolling over funds from your traditional IRAs to a qualified plan such as a 401(k) or 403(b) plan, and you can choose to roll over only your deductible traditional IRAs if you do this. By performing such a rollover, you can move all of them to a 401(k) or similar plan, leaving behind only nondeductible funds in your IRA. Then you can roll over your nondeductible funds to a Roth IRA. This preserves the basis in your nondeductible IRAs. It results in less income recognized on the Roth conversion. But keep in mind that you're only allowed to perform one rollover per year per IRA account. This applies to rollovers from one traditional IRA to another, from one Roth IRA to another, or from a traditional IRA to a Roth IRA. Direct trustee-to-trustee transfers from a qualified retirement plan such as a 401(k) or 403(b) account to an IRA don't count. Otherwise, any additional rollover after the first rollover within a 12-month period is treated as a fully taxable distribution and an early distribution penalty might apply. Roll over your deductible IRAs to a qualified plan in a trustee-to-trustee direct transfer. These transfers don't count toward the one-rollover-per-year limit. Then convert your nondeductible IRAs to a Roth IRA via another trustee-to-trustee direct transfer so as to avoid the mandatory 20-percent withholding. Income reported on a conversion to a Roth IRA doesn't always mean that the income will be taxed. The tax impact of reported income can be reduced through various tax deductions or tax credits. Let's say someone converts an entirely deductible traditional IRA worth $5,500 to a Roth IRA in 2016. Because these funds were entirely deductible, they would report $5,500 in additional income on his 2016 tax return. They are still entitled to take various deductions or tax credits, just as any other taxpayer could. They could, therefore, offset his $5,500 in additional income with any deductions that were available to him. For example, they might offset the Roth conversion income with $5,500 of qualifying charitable deductions or with a $5,500 business loss. In this case, their amount of taxable income would remain unchanged even though they had $5,500 in conversion income. That said, income reported on a Roth conversion obviously increases income before credits or deductions so a Roth conversion could potentially increase taxable income and trigger various phaseouts. An increase in taxable income is fairly easy to figure out. Take a look at the marginal tax rates for the year in which you're converting. An increase in taxable income will cost you roughly your marginal tax rate times the conversion value. Analyzing various phaseouts is a bit more complicated. Higher income could result in more Social Security benefits being subject to taxation, or it could trigger a phaseout or elimination of various deductions or tax credits. The best way to figure out the impact of a Roth conversion in these various circumstances is to run a projection in your tax software to analyze the tax increase resulting from a Roth conversion. You have funds outside of a retirement account which you could use to fully pay the tax for converting to a Roth. The value of your traditional IRAs has fallen and converting now is more affordable. You expect to be in roughly the same tax bracket or in a higher tax bracket in retirement than you're in currently. You can use losses, deductions, or tax credits to help offset the tax impact of a Roth conversion. You don't have cash funds sufficient to fully pay the tax of the Roth conversion. You expect to be in a lower tax bracket in retirement than you are in currently. You might need to tap into your IRA funds in the next five years and you are or will be younger than age 59.5 when that happens. It doesn't make sense to pay tax now at a higher tax rate if you reasonably expect to be in a lower tax bracket in retirement. It also doesn't make sense to pay tax now if you might have to tap into those funds in the next five years. In this case, you'll essentially be paying tax twice—once on the conversion and again on the withdrawal, plus any penalties that might apply. You'll receive two tax documents if you convert your traditional IRA to a Roth IRA, and you must report the conversion in two places on your tax return. You'll receive a Form 1099-R from your financial institution reporting the Roth conversion. It will be coded as a rollover to a Roth IRA. You'll use the information from that form to report your Roth conversion income on Form 8606 with the taxable portion of the conversion income reported on your Form 1040. Forms 1099-R are generally sent out by the end of January of the following year. Additionally, you should receive Form 5498 from the financial institution that received the Roth IRA funds. This form reports the value of the funds received and the value of the account at the end of the year. This form is generally for information purposes only. The data doesn't have to appear anywhere on your tax return. Form 5468 is usually mailed out by May 31. Consider consulting with a tax professional before you act because the Tax Cuts and Jobs Act, which was signed into law in December 2017, eliminates your ability to undo any conversions you make. It used to be that trustee-to-trustee transfers could effectively be "undone" if you recategorized the conversion before your tax deadline including any extensions but converting to a Roth account no longer qualifies for this treatment. The new rule also applies to rollovers from 401(k) and 403(b) accounts as well as traditional, SEP, and SIMPLE IRAs. Most provisions of the TCJA took effect in 2018, but special rules apply to this change. Roth IRA conversions made in 2017 could be recategorized until October 15, 2018. Unfortunately, any conversions made after January 1, 2018, cannot be undone. Should You Take Money From Your Retirement Plan?